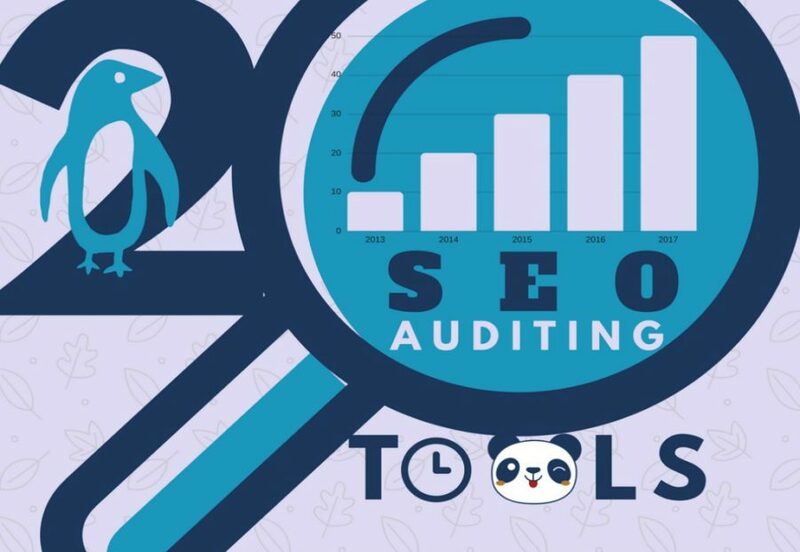 While your ultimate target goes to deserve your site’s presence on the top rank of SERP, you must need SEO audit using a comprehensive SEO audit tools. You need to make sure that your site is healthy that leverages Search Engines to keep your site on the top results. The SEO audit analyses the site, and determines the obstacles showing you the errors that need removal. A comprehensive SEO audit could help you to know where the factors located you need to treat them for a better rank. In the most competitive online business arena, your site requires quick result through quality treatment over the site problems. There’re many SEO audit tools available around the web you can go with one. 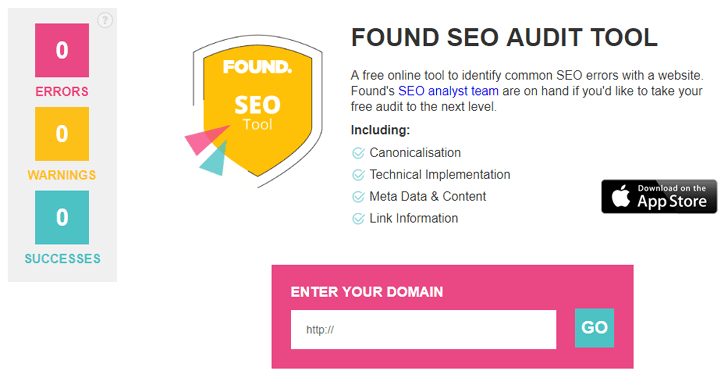 Considering all sort of requirements by SEO campaigners, here the top 20 best free and freemium SEO audit tools could help you determine your best ones. 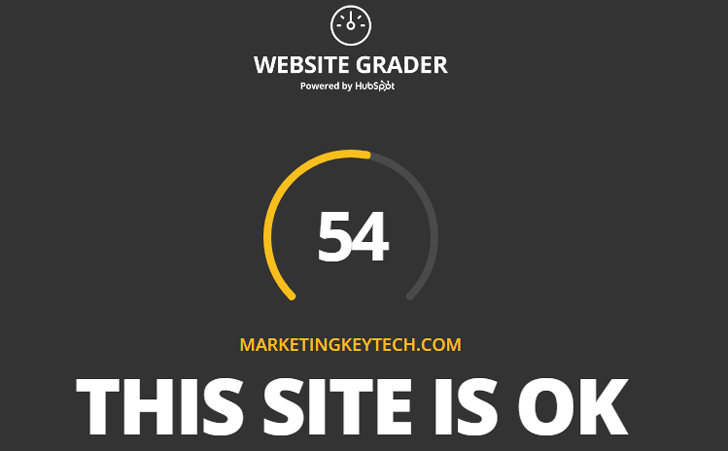 HubSpot released this Website Grader in 2007, free SEO audit tools, help to the businesses uncovering SEO opportunities for better ROI. In the meantime, this tool has got huge development that provides the personalized reports on SEO Audit. They suggest how much you need to optimize your site for natural performance for increasing traffic, conversion, leads and revenue. (a) Performance: On SEO audit, it analyzes page size, page requests, page speed, browser caching, page redirects, compression and render blocking issues. (b) Mobile Readiness: The tools check out and show how much your site is mobile-friendly considering responsiveness and viewport status. (c) SEO: They consider both human users and search bot that how much they are able to understand your site. In this purpose, it assesses the site page title, headings and meta description, and sitemap as the rank determining factors in SEO development. (d) Security: They assess the security considering SSL certificate. They indicate you that how much your service is authentic and trust-worthy to the users that depend on your security. They advise you to shut the front door with SSL certificate to show the users green signal. (e) Recommendation: What should I do next? In response to your such question, they conclude a set of recommendation in a table against every score of your site performance. All you need to input your site URL including email in the tool’s slot, you’ll find the audited report within a single minute. 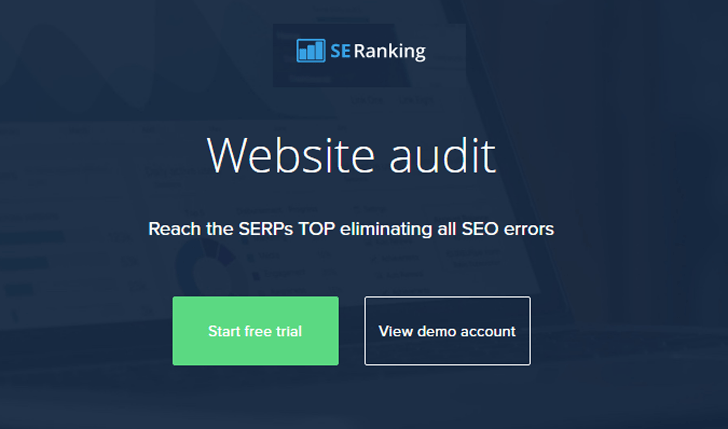 SEOptimer is a powerful SEO audit tool that reviews your site and provides a free pdf report. It audits the whole phase of your site including subpages that helps to improve overall on-page SEO. In addition, it provides SEO tips and easy actionable recommendation for your website SEO development and searches ranking. In terms of competitor analysis, SEOptimer can provide reports how you can check their sites and improve your race on the run. It is completely free to use. 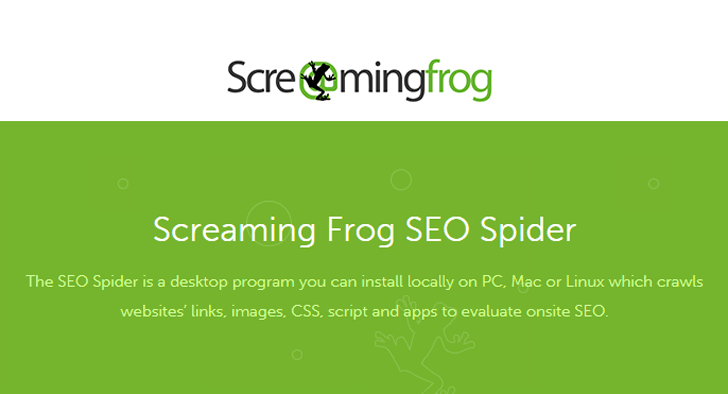 ScreamingFrog SEO Spider is a crawling tool provides report up to 500 pages or URLs free. This tool allows you to crawl your sites’ URLs and fetch key onsite elements to analyze onsite SEO for a clean report. You have a chance to download and install the tool for free on local PC. If you’re looking for a better audit of your on-site pages are not more than 500, you might start with this free offer to enhance your business. If you need a most effective professional SEO audit tool, then you might go with SE Ranking Website Audit Tools. It helps to provide a complete analysis and an actionable list of things that your content campaigner, web developer, and designers investigate. SE Ranking filter your whole site and uncover the errors on more than 6 dozens of parameters including domain overview, metadata, image optimization, link data analysis, mobile friendliness, keyword grouping, competitor SEO and so on. Every element of the parameters would guide you how to conduct the improvement that boosts your site on the top results. You can save the report in pdf for your future treatment plan. You have a chance to check out its valued performance over SEO Auditing skill using it’s 14 days free offer. As a free powerful service tool, Found’s SEO audits actionable things that work for SEO improvement. In terms of error and warning solution on-site SEO, new marketers can rely on this tool for better search marketing. All you need to input your URL to go finding back an instant audit report on 3 major sections, such as technical reports, content base issues, and external link analysis. You have a chance to download the report in pdf for future usage. Lipperhey is free SEO audit tools, but they offer pre-service as well. They help the users how to build their website caring the technical issues as well as SEO features that boost their site rank higher in the search engines. Their forever free to single project offer includes the key features they serve you, are: (i) Web analytics, (ii) Technical analysis on 30 technical subjects, (iii) Unlimited real-time page per page optimization, (iv) Monthly per request update analysis results, (v) Internet linking structure, (vi) Allows indexed 50 pages/project, (vii) Allows indexation testing, (viii) Website load-time performance, (ix) Validate external links, (x) Robots.txt checker, (xi) Sitemap.XML generator, (xii) Unlimited backlink analysis, (xiii) Backlink quality analysis, (xiv) Keyword suggestions, (xv) Keyword traffic estimation, (xvi) Search engine competition, and (xvii) Long tail keyword analysis. It is a complete SEO package forever free. After finishing the analysis, Lipperhey will show you the way in the real-time report that how you can improve your website Technical and SEO features. Their package supports you to grow your business with higher conversion rate. Web Gnomes is a comprehensive SEO inspection tool of your website at free of cost. It audits SEO factors within your site and sends you a report based on most important 20 on-page parameters. Their FREE SEO audit checks out your web page for the 20 most common SEO mistakes are categorized with accessibility, the content of headings, body content, and URLs. Their industry-leading SEO audit diagnoses your site’s weaknesses finds out site’s competition and delivers you an actionable recommendation for progressing your site’s rank that boosts your revenue. Dareboost provides an actionable accurate report on SEO audit you could understand easily to repair the issues. It performs amazing audit delivering analyzing data that improves web pages load speed and quality. 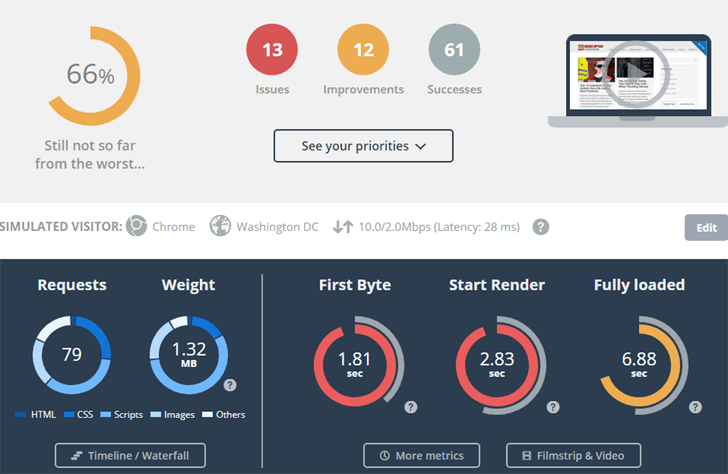 Dareboost daily analyze your web pages to identify quality issues and loading time performance. It helps valuable recommendations with comparison option and monitors your site. You could find the analysis of your pages including major driving factors on your dashboard at any time. They’ll email you weekly report as well. If you’re a new user, you might grow your business using it’s major two features: the site speed and site quality for free. 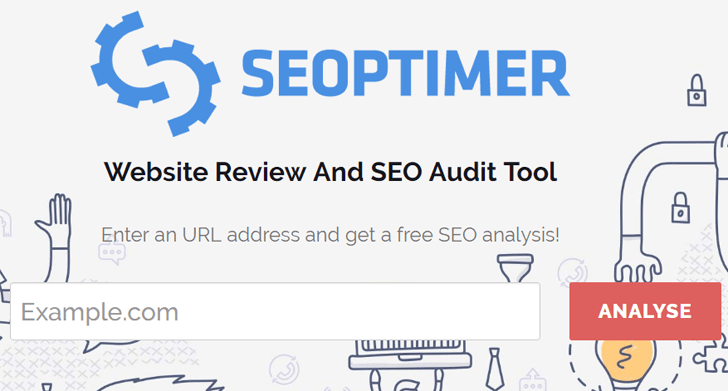 SEOmator is a comprehensive SEO audit tools that provides most effective in-depth data on both of SEO on-page and off-page. It performs a complete analysis which you can download or as white-label pdf. The report includes insightful charts for easy understanding the remedies. Seomator works as a prolific master tool you could find the service exactly what you need for the authentic SEO development. In addition, it helps to figure out your position with competitors using Domain Comparison tool that leverages you how to overtake them and keep your presence ahead on SERP. It analyzes and provide reports more than 50 detectable issues within 10 categories: such as (i) Crawler report (ii) Structured data (iii) HTML Tags (iv) Page Speed (v) Internal Links (vi) Content Quality (vii) Backlinks (viii) Social Media (ix) Multilingual Support, and (x) Mobile Usability. You have a chance to prove its complete performance using pay as you go plan for a single project. Although it doesn’t provide a complete picture of the issues, still Google Search Console is a best basic tool for the beginners finding the issues and troubles. Yet, most of the users including professional SEOs, newbie bloggers, marketers and small business owners prefer this free tool for SEO development and online marketing. 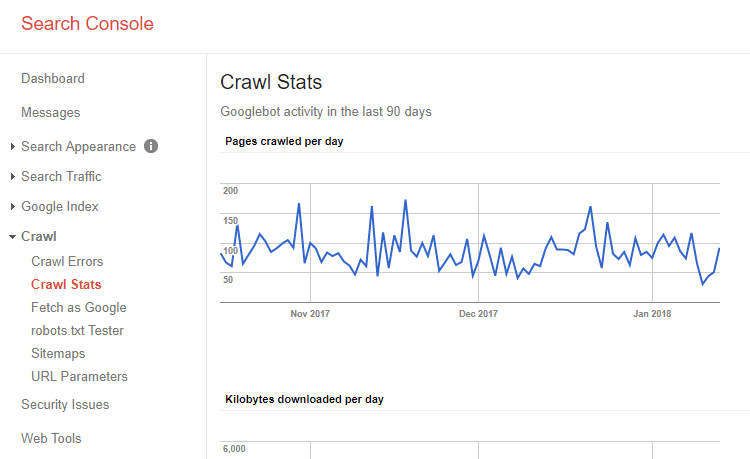 Google Search Console contributes to the users showing at a glance picture, such as indexed web pages, HTML markup, page load speed, and broken links. It also provides search traffic metrics, number of clicks, traffic sources, number of impressions, links to your site, internal links data, mobile usability and many more. That’s why this tool is unavoidable great tools by most of the users you shouldn’t ignore. (b) length and relevancy of the title tag, description meta tag, keywords and keywords meta tag, and robots meta tag directives. (h) page Heading and Phrase elements. If you’re a beginner in your site SEO management, you might play this tool simply better. But the creator of this tool disclaims that it shouldn’t be used as your sole tool because nobody knows the exact algorithm of the Search Engines that can be matched accurately with a tool. 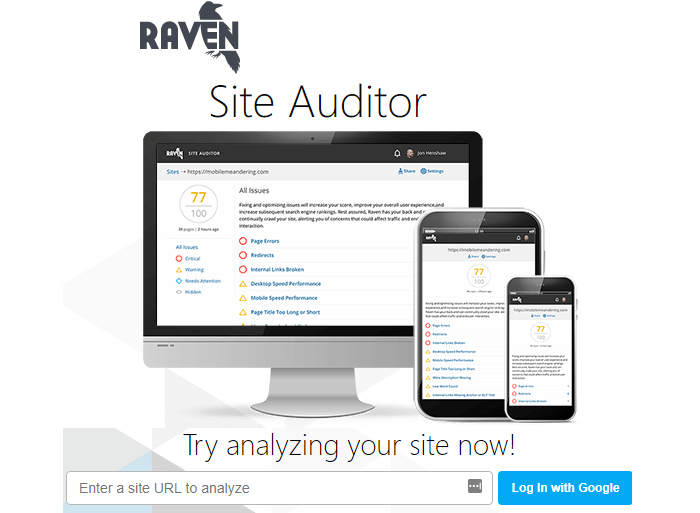 Raven Site Auditor is another powerful SEO analyzer. It’s the best fit for your single one small business to use forever which allows 50 pages per month. All you need to enter a site URL to analyze the total SEO health of your site. The auditing software would provide you quick data with the significant issues including a list of actionable recommendations how to develop the site. It recommends how you can progress your site load-speed, mobile-friendliness and online business presence available. While you’re not able to fix the issues, you have a chance to share your results with your SEO expert or webmaster someone. Raven leverages you to find the accurate problem, recommendation to fix and get your site significant rank. Varvy SEO Tool is an in-depth SEO analyzer that leverages the user’s site fit for better SEO. It’s just to input the URL and wait a few seconds to find details of audit results that include issues are: Google access, mobile devices, security, accessibility, page speed, robots.txt guideline, image alt text, sitemaps, If modified since, paid links, valid HTML, amount of links, findable links, and HTTP headers. The amazing part of this tool is providing image indexing data to the users that help to improve the images on the site. In the generated data, you’ll find red texts are an accurate problem you’ll need to solve. Every box data has particular guideline what you need to do for the issues to fix them accurately. WebCEO is a hyper-productive technical site auditor and SEO analyzing tools, works like an expert to detect the site errors. It identifies the broken Links, anchors, poor speedy pages, server problems, missing images, inaccessible pages, and so on. (a) Technical Site Audits (b) Site Usability Checks, (c) Easy-to-Follow Tips on How to Fix Errors and Issues, (d) Automated daily/weekly/monthly/quarterly Scans, (e) DIY SEO Checklist, and (f) Professional-Looking PDF Reports. As it delivers results in pdf format, If you run the tool regularly, then they’ll send you email alerts while they got further errors on the site. You might try the tools if you have an extensive business site. Woorank is a branded SEO Checker and instant site analyzer. 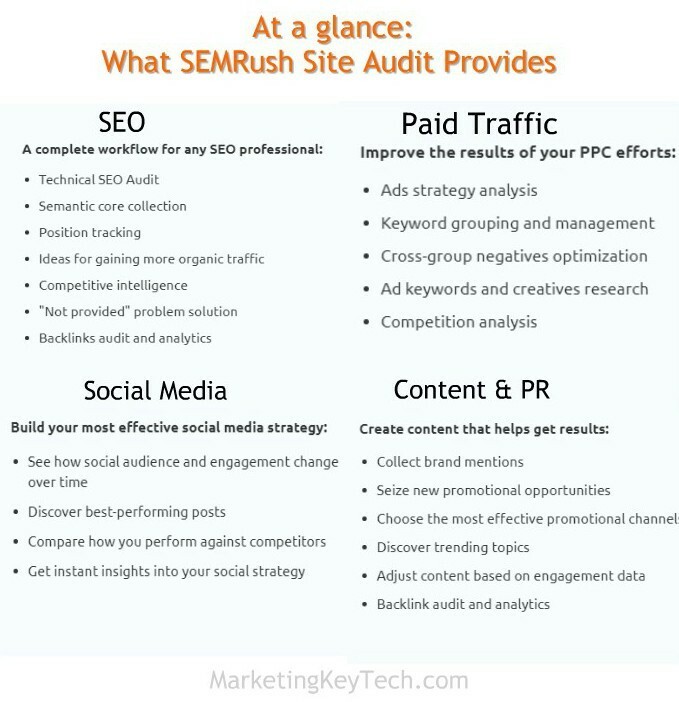 It performs full scall of auditing from SEO to Digital Marketing. Woorank tracks keywords crawl pages and provides the report to your email regularly. It monitors your site round the clock and provides notification to you. This branded tools avails 6 languages such as English, Spanish, French, German, Portuguese, and Dutch. SEO Site Checkup is an ultra-fast supercharged analyzer and monitoring toolbox. It detects troubles of a site and provides real-time data. While I test a site as shown below image I got a clear picture that includes 49 issues. Get everything SeoSiteCheckup already has, plus more powerful tools and faster execution. Try the new features of our supercharged SEO ToolBox using a 14-day free trial account. Wpromote is a web-based in-depth SEO auditing tool that leverages all sort of users with real-time results. It is simple, authentic and completely free auditing tools – provides comparative analytical data between you and your best competitors. They provide you the services are: domain authority, Google indexed pages, Google link counts, top keyword rankings, and robots.txt. Using this great tool you could find the exact problems of your site with appropriate remedy to cure the errors. All though, a free tool, but they are real-time responsive in any issue. Using their worthy auditing software you could able to build your own strategic marketing that keeps you ahead. The site auditor ‘Nibbler‘ is free, though auditing is limited within 5 web pages in a single page of detailed reports. Not bad for the newbies and small businesses who could get chance to conduct 17 individual tests. Besides of free offer by Nibbler for limited pages, they offer a paid plan by name of silktide insights. The paid version offers 100+ web pages, comprehensive reports, 32 individual tests including extra something like spelling, search ranking, broken links, export reports, further support, and logo customizable. MySiteAuditor is another prolific site auditing tool that deserves a great demand among professional users. It works within a targeted set of web pages and keywords that bring back all sorts of errors, obstacles and performance quality on to a pdf format of result sheet. As it’s integrative feature can embrace with your agency site, then you could find sophisticated advantages to provide prompt service to your clients with higher satisfaction. Thus it will make a huge number of target-oriented prospects or leads as well which leverage your business growth 10 times faster as they generate leads accordingly. You can upload your logo, own brand color, and contact info for customization. Every lead will be set in your email. While you’ll check the usage in a trial, you could find unlimited, beautifully designed, website audits on your prospective clients’ sites. You could run unlimited website audit reports, white-label of your audits- audit includes SEO, social, and mobile analyses. 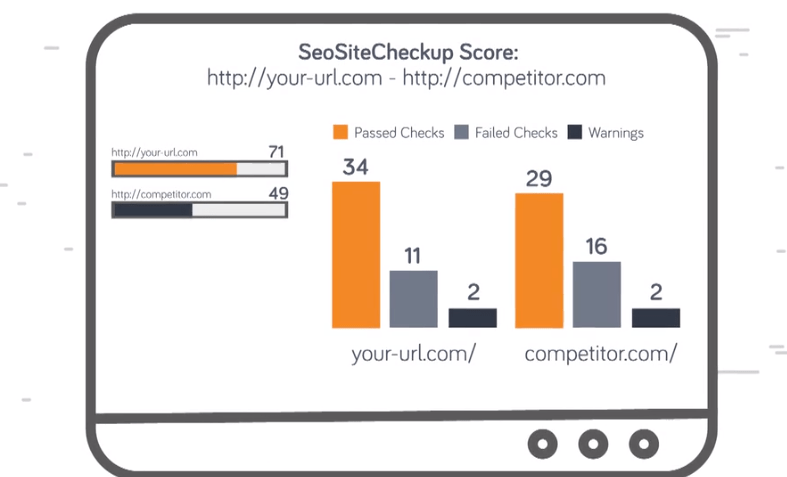 And you could compare websites with competitor analyses; download print, and email your audits. No credit card is required, you might start your <free 10-day trial> for quick growth of your business. SEMRush is completely an extraordinarily useful SEO tool-set that helps to the users providing most effective actionable data. Using this prolific tool in auditing you could find the analysis report in your convenient format and user on demand. It has all sorts of capability to provide you accurate feedback on the existing SEO and other issues of the site. Then, you could make your action plan where the negative SEO issues you need to treat exactly following the Google’s guideline for further enhancement of your SEO score. In your every event of SEO treatment, after fixing the result in right order, you could simply uncover an amazing betterment that boosts your SEO rank for better ROI. All you need to go with this and get the taste of its difference, really outstanding. In your real practice of business competition, a reliable hybrid SEO auditing tool is essential in terms of your sustainable business. The free tools are an amazing gift for the newbies. According to experience, you never should underestimate your competitor’s intelligence. Then, all you need to try the best potential once for a series of quick assessment and start using the best one that deserves best of its professional standard. So, be analytical with your better SEO audit tools, as the businesses love the analyzers best. Stay ahead of your competitors. What is your opinion on best free ones you prefer to use? If this helps you I can hope your worthy share.